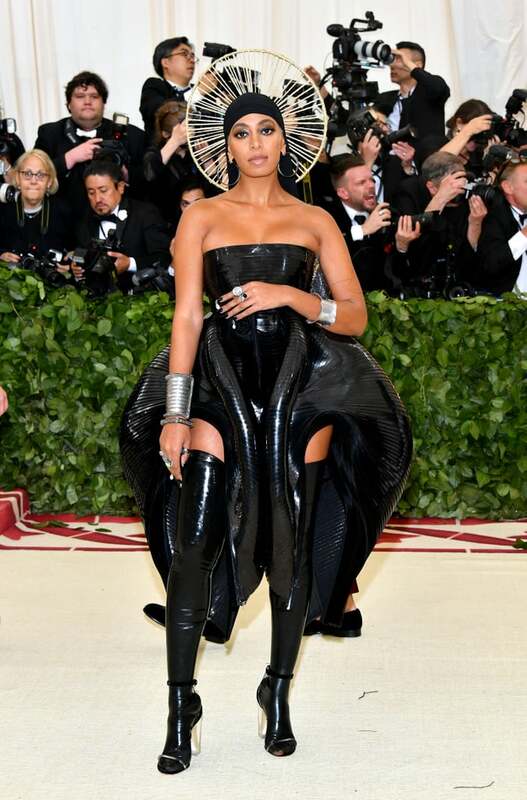 Handcrafted couture, eco-fabrics and vintage gowns; see the best of sustainable fashion from the Met Gala 2018. On 8th of May all eyes were fixed on New York’s annual MET Gala. Fashion icons lit up the red carpet adorned in extravagant couture, honouring the theme of year. This time, it was “Heavenly Bodies – Fashion and the Catholic Imagination”. It was all about Vatican glamour, papal robes and fashion inspired by the early twentieth century. We were in awe of the elaborate accessories like bejewelled papal tiaras, medieval knight’s headgear in gold chainmail and even ethereal angel wings. And after careful deliberation, we have picked top sustainable looks that truly had us shook! Ditching the dramatic train, the queen of fashion proved that she a true Pope-star! Looking fiercer than ever, Riri wore a pearl and jewel-encrusted robe, with papal mitre and necklace, Louboutin heels, and hoop earrings by Maria Tash. Her first Margiela to the Met, this artisanal costume was handcrafted over hundreds of hours. One of a kind and opulent, the labour of love won everybody’s applause. Channelling her inner angel, supermodel Gisele Bündchen looked exquisite in a lustrous champagne Versace gown. In her Instagram sneak peak before the event, Gisele disclosed that she was looking for an “eco dress” when she found this Versace number. The fabrics used are GOTS Certified; ecologically dyed 100% organic silk and cotton. Gisele has been an advocate of sustainability for sometime now. In 2014 she wore an eco-friendly dress to the Rainforest Alliance Gala and a sustainably sourced Stella McCartney dress to the Green Carpet Fashion Awards in September. We love her for showing that sustainability can be stunning too. Miley Cyrus used this event as a platform to promote veganism and cruelty-free fashion. Straying away from the glitz galore, she kept it sophisticated yet bold with a floor length, figure-hugging mermaid gown by the maestro of sustainable fashion, Stella McCartney. Going for a timeless black satin dress that created subtle drama with plunging neckline and open back, she stood out for her from the crowd, spreading the good word, all the while looking supremely chic. Solange is giving us that ultra glamorous, extra-terrestrial Rockstar vibe in this slick Iris Van Herpen couture. The futuristic dress is an archival piece from Iris van Herpen’s Fall 2012 couture collection. The designer is known for using alternative materials, like recycled plastic, and cutting edge technologies, like zero-waste 3D printing, to create her works of art. We love Solange for supporting innovative solutions to sustainability, and for just being so, so fierce. Founder of Eco-Age, Livia Firth is a maven of ethical fashion. Please sit down and take notes on how to work the green carpet. Dressed in a bright white, high neck silk gown with a cape, designed by Giambattista Valli, Livia is the epitome of serene refinement. The silk fabric is sourced from Taroni, a company that is committed to sustainability and responsible production. In 2017, Taroni won the title of Sustainable Producer at the Green Carpet Fashion Awards in Italy. She completed her look with Chopard jewels, a gold clutch, and a pair of old shoes, as she is committed to get her #30wears. Sticking true to her roots, the Black Panther star, Letitia Wright embraced her religion and Ethiopian culture in a handmade Coach gown featuring golden cloth and embroidery that was inspired by the Ethopian pastor’s robes. She also did an Ethopian up-do to bring the whole look together. A team of five girls hand-stitched and hand-beaded the entire gown that took six months to finish. The effort clearly reflects in Leitita’s striking poise. Not always a patron of sustainable fashion, Kim Kardashian surprised the crowd with a golden body-hugging vintage Versace gown. The minimal gown was a nod to the nineties and cross detail suited the religious theme of the evening. Nothing says sustainable than a stunning vintage dress, Kim here is a perfect example of that.